Our hard work over the years is starting to pay off. Your interest and support have been very helpful as we clearly sharpen our focus on price/performance. Our vision is to maintain leadership in price/performance, regardless of what competition we may encounter along the way. 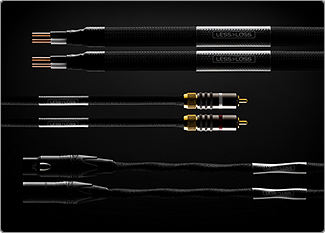 "LessLoss cables were always special contenders in the world of high-end audio. A few first notes resounding would always bring a vivid projection of what makes them special and different." "LessLoss has in recent years, step by step, introduced more and more affordable products while at the same time maintaining performance which matches and even rivals high-end audio cables and accessories at much higher prices." "It is undeniable that Louis and his energetic team at LessLoss pushed hard in order to maintain and even surpass what has become renowned in the name of LessLoss performance, but at a much more affordable level." "Developing this performance at this type of pricing can only be described as a welcome advance for us audiophiles." "In a very true sense, the LessLoss Homage To Time interconnects encapsulate the primary function of transmission of all that is ‘of a higher plane.'" "Higher harmonics are very informative with Homage to Time. They are well focussed and maintain a more natural integration with the main pitch. It becomes easier to discern subtleties relating not only to our western traditions of tuning, but also reveal the same about the complexities of eastern microtonality and harmony." "Homage to Times delivers a prominent set of positive attributes and my listening notes show similar results even when exchanging amplifiers. These include liquidity, transparency, ease of flow, and a feeling of undeniable unwavering and stability." "Speed and spirit evolved over and above what one might be expecting at this price point, and gave the much bigger boys a good run for their money." "LessLoss Homage To Time managed to describe and convey mountains of these attributes that achieved with what I can boldly call proper high-end audio transmission. It is true that not everything expensive or labeled “high-end audio” is worthy of such nomenclature. Homage to Time truly is." "Homage to Time cables follows faithfully a track that LessLoss has laid down securely in their earlier years. This is a difficult task. Maintaining their already recognized sonic potency and value in times where so many desire to get on the same bandwagon without delivering the goods, this defines and fortifies the LessLoss brand image in the high-end audio industry. This is not a small achievement! Bravo, LessLoss!" "The LessLoss Homage To Time interconnects were born of experience by a mature designer, come with the undeniable LessLoss DNA and, most importantly, with sonic performance that not only convinces, but convinces in strides." "For what the LessLoss Homage to Time XLR balanced interconnect achieves and at what price point it does this, I’m garlanding it with two awards at once. These cables more then deserve both our Highly Recommended and Best Buy awards. This is the first product Mono And Stereo has ever given both awards at once to, and in doing so we want to make a clear statement as to what high level they perform at and how well they’re executed." 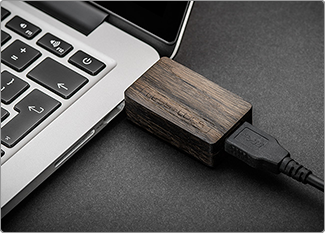 6Moons says USB Firewall Key "better than most cable swaps"
"A compact $410 sticker for the type of audible effectiveness I observed with these wooden modules meant good ROI." "In their current form, these devices gain a very solid recommendation even if you've already invested in a proper AC conditioner." "rounder, fuller, more fluid and suave [sound quality]"